Future note: Well, this blog post is now called an “attempt” because (spoiler alert) below is me failing to properly make the feature I wanted. Oh well. I still feel I will document this as a “full day spent working on a feature”, it just happens that the feature I was doing needs to be partially redone. I don’t really know how to solve this algorithmicaly. Everything I think of just leads to more issues. My room logic is already convoluted enough. 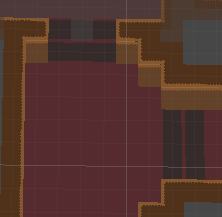 I can’t just change the room layout to have an extra wall, because rooms are rotated and this would mess it up in all directions. 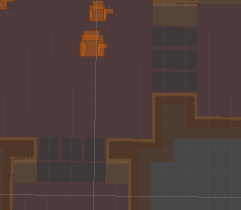 I can’t manually add wall pieces, because I don’t know what side is okay to expand walls towards (and both could be not okay). All my rooms are now bigger by 1 tile though. 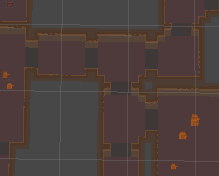 At this point, I am really questioning this double horizontal door logic, when my vertical doors are visually a single tile. May be I should have kept overlapping the room horizontally, just not vertically. But I really don’t want to go back to the whole overlap mess again. In fact, at this point I spent a lot of time fixing and adjusting how a lot of things work due to these changes. I have now added way too many tile designations — different wall types, multiple door types (and that’s just one side of double-doors), door hinges. I have added the requirement for several sprites I will need for double doors, and the doors need to match the wall type as well. 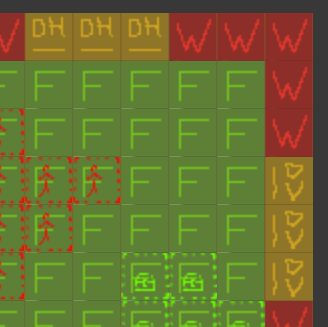 And due to double doors, my fog of war is completely broken and needs ridiculous rulesets to properly flood-fill visible areas. 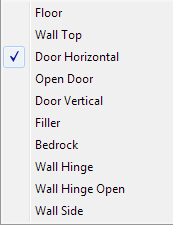 And all my wall top troubles also translate to doors, except those also need to open. In short, I’ve already complicated it all beyond what I want and I haven’t even gotten to some of the trickier parts. 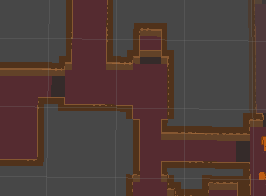 Unfortunately, I will need to go back to overlapping rooms and rethink my wall approach. I now believe the whole top and side wall separation was a mistake and I should have done this in the same tile, just make it “taller”. I will keep some of the above changes, but I will redo others.